Discussion in 'Sports and News' started by YankeeFan, Jul 1, 2011. Is it Syria? No. In fact, this new war won't add any additional stress to the US military. But, it does have parallels to our action in Libya, where we are bombing Gaddafi's troops in order to protect the citizens of Eastern Libya. So, who are we protecting? The spotted owl of course. And the plan is to shoot barred owls in order to protect them. The barred owl, a bigger, more adaptable bird with a broader diet than the flying squirrels and the wood rats that spotted owls prefer, has expanded its range westward in the past century, and it is now a more common resident than spotted owls in many Northwest forests. 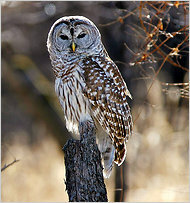 Sometimes barred owls even kill male spotted owls and mate with females. Others are less sure. While some early experiments showed success, Dr. Forsman, the Forest Service biologist, questions whether barred owls could be managed on a broad scale, if it came to that. Cost for this experiment: $22.5 million, per day. Just guessing but I bet I'm close. If barred owls can mate with spotted owls, then the future is blobby owls, whether the Fish and Wildlife Service likes it or not. There are rumors that France is arming the spotted owls. No confirmation yet. I hear spotted owl tastes great breaded and fried. Which tastes great breaded & fried. Actually tastes a lot like Bald Eagle. Picturing barred owls going up to spotted owls and saying, "mind if we dance with your dates?"